To combat contamination, education is key. But not just any education will do. As service providers, it’s important to use the same simple and consistent message across the community. In 2015, the City of Sioux Falls launched a recycling education campaign with the help of local haulers and recyclers. The goal was to provide residents with consistent guidelines to follow, no matter which hauler they used. As part of the campaign, the city offers free bin labels and a simple Yes and No flyer available on their website and mailed out twice a year. 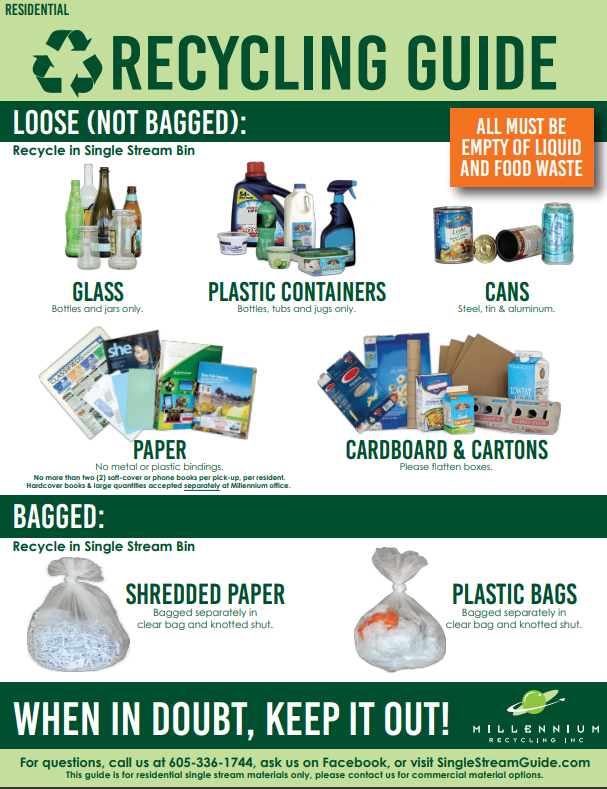 Consistent Communication: Use the City provided recycling flyer and category items on your website, on your containers, and anywhere you list what items you accept. Keeping it consistent across all service providers will help eliminate customer confusion! Direct Questions to Millennium: For those who are passionate about recycling right and want more detailed information than what’s included on the guide, we encourage you to direct them to the Millennium’s Facebook page or website search tool to ask questions on anything and everything recycling. Emphasize the Value of Recycling: From extending the life of the landfill, to creating jobs, to reducing pollution and conserving natural resources- recycling is a valuable service that benefits our community and should be communicated as such, even in the face of industry challenges. For those outside of the Sioux Falls 5-County area, Millennium created a similar guide with the same Yes and No items shown, but without the City of Sioux Falls language. Contact us to request free copies. There are 0 comment. on "Consistent Education is Key to Recycling"